A bus journey from Órgiva to Granada, one of the great cities of Spain, is a joy. The views from the winding roads are to die for (just hope the driver doesn’t have a heart attack) and the glimpse of the Sierra Nevada a marvel. The gigantic wind-farm sails, eerie and motionless on windless days, look like an Hieronymus Bosch painting. Even if you have a car you could always leave it behind. The scenery is breathtaking, which you’d miss as the driver – especially around Lanjarón – and once there you could enjoy more than just one bottle of beer. The bus takes around an hour and 15 minutes from Órgiva (see timetable below). It leaves just up from Dia supermarket and costs €5 per adult, one-way. For a day in Granada we suggest getting the 8.15am or 8.45am bus and the 4.30pm return. Sit on the left (as you face forward) for the best views. The Estacíon de Autobuses is out of town to the north West (the bus does stop once or twice before then, so if you do get off, know where you are). On arrival, take the escalator up to the ground floor and head out the exit, bearing slightly left. Get a number 33 into the centre (number 3 is fine too but we’ve never got this). It takes 10 to 15 minutes and costs €1.20 per adult. Travelling down the Avda. de Constitucíon we normally get off just after the Parque Fuente Nueva and walk down San Juan de Dios (a good place for breakfast is Café la Cala). After five minutes, bear left and head into the centre. Tip: Another way into the centre is to get off the bus before the bus station at the HELICOPTER (a real one hoisted above the traffic). Others are likely to get off at this point, so keep your eyes peeled. If you need a ticket, get it on the ground floor where there’s also an information desk. Head back down the escalators for the buses, café and the try-not-to-use-them-if-you-can-help-it toilets. If you’re in a rush you can also buy a ticket on the bus. The 4.30pm bus to Órgiva normally sets off from bay 7, although check. On the timetable board the bus you want is to Berchules. The front of buses state where they’re going and always state ‘Órgiva’. The bus stops near to both Alpujarra and Dia supermarkets. At the moment, we’ve no choice but to take the bus – but that’s fine by us. We’re what The Inbetweeners call…no, let’s not go there. 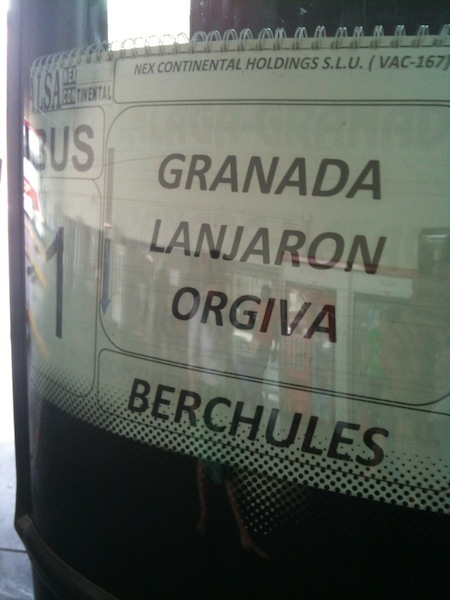 Órgiva to Granada [* = quicker bus].